Distillers take notes at the 2017 Sustainable Spirits Summit. Each year, the Energy and Environment Cabinet’s Division of Compliance Assistance (DCA) partners with the Kentucky Distillers’ Association to host an event that allows industry members to discuss issues and share their efforts of environmental stewardship and sustainability. The Angel’s Envy distillery introduced an idea at the 2017 summit from their social media campaign that is not only good publicity for their distillery, but also benefits the environment. According to their website, Angel’s Envy distillery has planted 24,032 white oak trees since 2014 due to their social media plan. The trees are planted by employees through a partnership with Green Forests Works and the Arbor Day Foundation. The team is steadily working to reclaim land previously given over to strip mining in Kentucky through innovative thinking that tackled both marketing and a heavy issue for the bourbon industry. The hashtag that featured Angel Envy’s product. Photo courtesy of Angel’s Envy. An Angel Envy’s worker plants a white oak seedling. Photo courtesy of Angel’s Envy. Currently, about 6.6 million barrels of bourbon are aging in Kentucky. Bourbon can only be aged in charred, new white oak barrels so the white oak found in Kentucky is in high demand to the distillery industry. White oak also is an important tree for many Kentucky ecosystems, as it acts as both a food source and a home for many species. Unfortunately, it is a slow-growing tree so any effort to make white oak more sustainable is a good thing for both the Commonwealth and distilleries. Spirit industries face unique environmental challenges. By providing a place for conversation, questions and idea sharing, master distillers and industry representatives are able to compare notes, brainstorm solutions and share best management practices for the overall health of Kentucky’s ecosystem. Ideas are exchanged at the summit that takes place on distillery grounds. Photo courtesy of DCA. 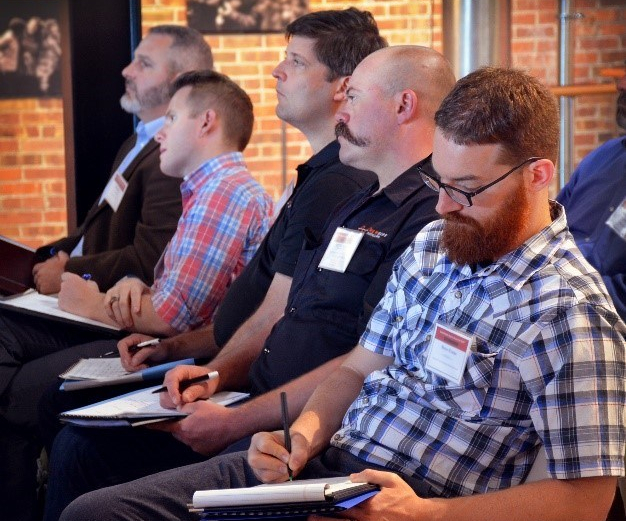 This spring, DCA will begin to hold separate workshops specifically targeted at distilleries, craft brewers and hopefully wineries. Angel’s Envy will be hosting the next summit on Oct. 23, 2018. For more information or to register for the summit, please contact Robyn Whitted by e-mail at Robyn.Whitted@ky.gov or by calling 502-782-6476.